When post-processing the image, I thought setting the White Balance as "Tungsten" worked best. I get a cool blue tone that matches these colder days. I also did some minimal perspective correction on the window lines. 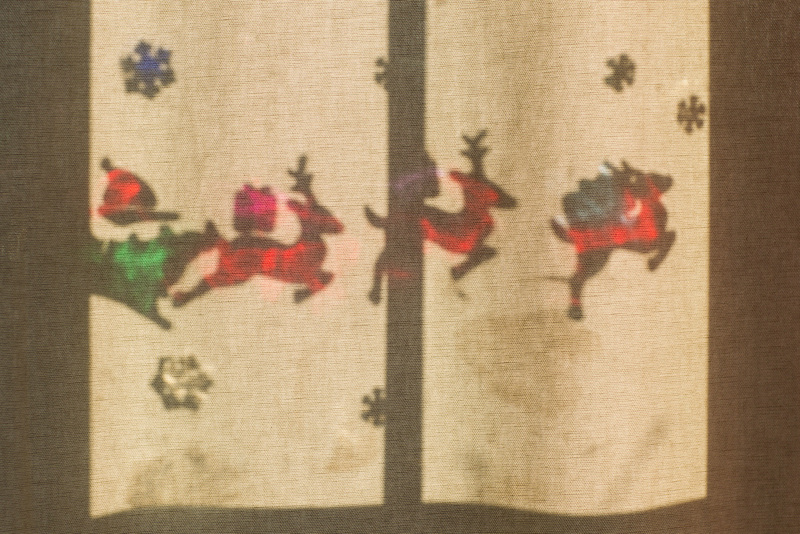 Later in the afternoon, the Sun light was creating some very interesting shadows on the closed curtains. Very cool. On the last image we can see all the decorations reflected, the small tree we have in front of the house, and one of Lucas trucks parked in the window. For these last two images, I switched to "Daylight" White Balance because it was pretty much the way I remembered the scene and the right amount of "warmth" for me. It is cold outside, but it is a time to celebrate with family in the coziness of our homes.